The Capital Area Ag Report for August 28, 2014 is now available online. Click here for the issue in PDF format. Last week temperatures ranged from 2 degrees below normal to 4 degrees above normal. Precipitation ranged from a trace to over 3’. Base 50 growing degree-days ranged from 80 to 140. High pressure will bring dry but cooler weather for the next two days. The holiday weekend will warm up but bring a chance for showers and thunderstorms. Today will be partly sunny with temperatures throughout the 70’s. Overnight temperatures will be in the mid 40’s to low 50’s. Friday will be sunny with highs in the 70’s. Low temperatures will be in the upper 50’s to low 60’s. Saturday will be partly sunny with a chance for showers and thunderstorms, highs will be in the low to mid 80’s. Overnight temperatures will be in the low to mid 60’s. Sunday will be mostly cloudy with showers and thunderstorms likely, highs will range from the mid 70’s to mid 80’s. Overnight temperatures will be in the upper 50’s to mid 60’s. Monday will be mostly cloudy with scattered showers and thunderstorms, highs will be in the mid 70’s to low 80’s. Overnight temperatures will be in the upper 50’s to low 60’s. Tuesday will be partly sunny with scattered showers and thunderstorms with highs in the low to mid 80’s. Lows will be in the 60’s. Wednesday’s highs will be in the upper 70’s to low 80’s with a chance for showers and thunderstorms. Lows will be in the 60’s. The five-day precipitation amounts will range from 1/10 ” to ½ ” ; 7-day amounts will range from ¼ ” to ¾ ”. The 8-14 day outlook (Sept 4-10) is showing above normal temperatures and above normal precipitation. The three-month outlook for Sept/Oct/Nov is showing above normal temperatures and equal chances for precipitation. 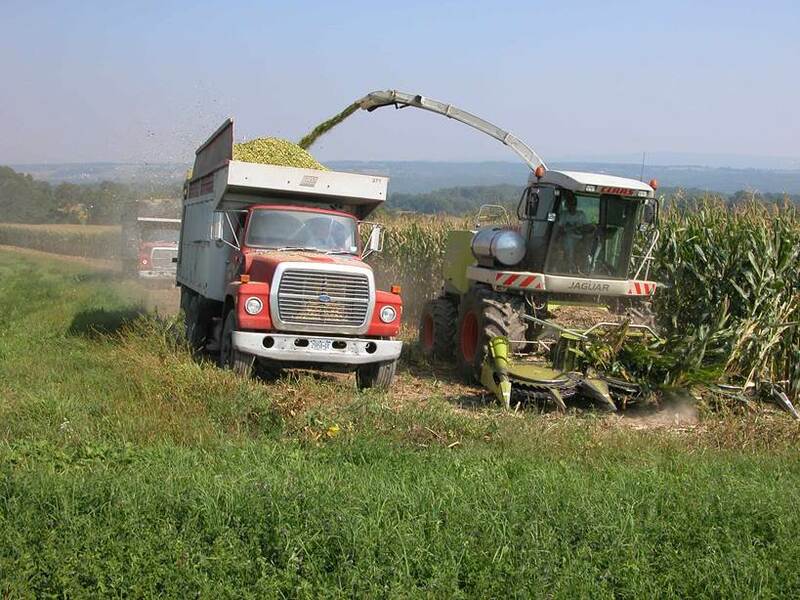 Northern New York – On-farm research trials funded by the farmer-driven Northern New York Agricultural Development Program shows some NNY farms have achieved notably high corn yields. These gains prompted farmers to want to know if the Cornell University nitrogen fertilizer and manure application recommendations derived from corn yield potential calculations need to be revised. Twelve Northern New York farms teamed with Cornell University researchers, Cornell Cooperative Extension field crop specialists and regional crop consultants to investigate whether higher crop productivity means more nitrogen needs to be supplied to replace that taken up by the corn or are new corn varieties simply able to make better use of the nitrogen already in the soil? 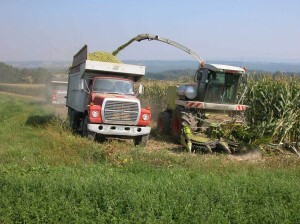 The NNYADP-funded project included a review of New York State annual corn silage and grain yields from 1919 through 2011. New York corn silage and corn grain yields have increased steadily over the past 40 years. The results of the NNYADP trials now available from Cornell Cooperative Extension and posted online at www.nnyagdev.org show that eight of the 22 Northern New York cornfields in the 2013 trials exceeded yield potential expectations. ‘Although research in the past 10 years has shown that for many sites the corn yield potentials in the Cornell soil database are in line with actual yields, and on average the harvested yields across the 23 fields tested in NNY in 2013 equaled the yield potentials listed for the soil types of the production fields, there are some notably high yields among the Northern New York fields,’ says research leader Quirine M. Kettering, director of the Nutrient Management Spear Program at Cornell University, Ithaca, NY. Ongoing research is investigating the impact of soil type, drainage, and management on corn nitrogen needs and yields and evaluating a new adaptive management protocol that allows producers to exceed current Cornell University guidelines for nitrogen application to corn. Farmers are using application rates based on either the results of two years of on-farm replicated trials indicating nitrogen needs, or actual yield measurements plus the results of the corn stalk nitrate test/CSNT and other tests such as the Illinois Soil Nitrogen Test/ISNT to indicate nitrogen need on a field-by-field basis. Researchers are emphasizing to farmers the importance of obtaining accurate corn yield measurements and keeping good records to help support development of improved Cornell yield potential calculations and nitrogen application guidelines. A second year of data from farms in Northern New York will be collected after the 2014 corn harvest. The farmer-driven Northern New York Agricultural Development Program has funded annual on-farm corn variety trials and corn production research to enhance the efficiency, profitability, and stewardship of farms in Clinton, Essex, Franklin, Jefferson, Lewis and St. Lawrence counties. The complete Evaluation of Yield Potentials of Corn Grain and Silage in Northern New York to Improve Crop Production, Nutrient Recycling and Environmental Protection report is online at www.nnyagdev.org. The Capital Area Ag Report for August 21, 2014 is now available online. Click here for the issue in PDF format. Last week temperatures ranged from 4 to 8 degrees below normal. Precipitation ranged from ¼ ” to over 2’. Base 50 growing degree-days ranged from 40 to 120. Cloudy and rainy couple of days gives way to nice, dry weather Saturday through Wednesday. Today will be cloudy with showers and thunderstorms with localized heavy rain; temperatures will be in the mid to upper 70’s. Overnight temperatures will be in the upper 50’s and low 60’s. Friday will be mostly cloudy with temperatures in the mid to upper 70’s with scattered showers and thunderstorms possible, a few could be strong. Low temperatures will be in the upper 50’s to low 60’s. Saturday will be partly sunny as high pressure returns, with a small chance of showers and temperatures throughout the 70’s. Overnight temperatures will be in the mid 50’s to low 60’s. Sunday will be partly sunny with highs throughout the 70’s. Overnight temperatures will be in the mid 50’s and low 60’s. Monday will be partly sunny with highs in the mid 70’s to near 80. Overnight temperatures will be in the mid 50’s to low 60’s. Tuesday will be partly sunny with highs in the mid 70’s to low 80’s. Lows will be in the mid 50’s to low 60’s. Wednesday’s highs will be in the mid 70’s and low 80’s. Lows will be in the upper 50’s and low 60’s. The five-day precipitation amounts will range from ¼” to 1 ½ ” ; 7-day amounts will range from ¼” to 1 ½ ”. The 8-14 day outlook (Aug 28 – Sept 3) is showing below normal temperatures or all but eastern NY and above normal precipitation. Corn silage will probably be late this year but corn planted by June 8th should attain 68% whole plant moisture. Corn producers in NY only planted ~20% of the crop by May 15, ~60% by June 1 and ~80% by June 8th. 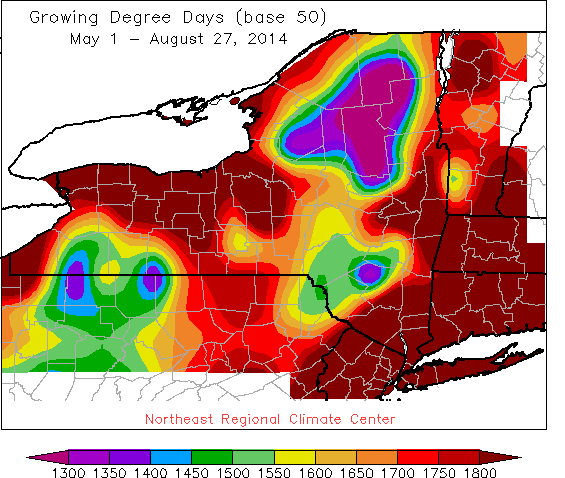 Most locations in NY received ~30 to 50 growing degrees (GDD) above normal from June 1 through July 15 so fears of immature or wet corn at harvest for late-planted corn were allayed through mid-July. Since then, however, most locations in NY, especially the Finger Lakes and western NY, have received ~75-150 GDD below normal through August 18th. Consequently, fears of immature corn silage, or immature grain or wet and low-test weight grain have once again risen. What is the probability of this doom and gloom scenario? I think that fears are overblown at the moment because of three important factors. First, the National Weather Service (NWS) has predicted above normal temperatures in NY for the final 2 weeks of August (don’t ask me why I still believe them!). If this holds true, August will come in only ~40-80 GDD below normal for the month and the crop in eastern and northern NY will be close to normal development, whereas the crop in central and western NY will be about 5 days behind. Second, many growers dialed back their maturity (as recommended in the May 16th posting) by 5-10 days once planting was delayed until early June, which greatly enhances the probability of maturation before a killing frost . Finally, corn hybrids (90-100 day relative maturity) that are planted in early June require about ~75-100 less GDD to mature than when planted in early May. In other words, if a grower planted a 100 day hybrid in early May, that hybrid would require about 1200 GDD to silk, another 850 GDD to attain 66-68% moisture for silage harvest (2050 GDD total), and about another 150 GDD to attain black layer (2200 GDD total). The same hybrid, however planted during the first week of June would require about 1150 GDD to silk, and 800 GDD to 66-68% moisture for silage harvest (1950 GDD total), and another ~150 GDD to black layer (~2100 GDD total). Will this scenario of less GDD to maturation with delayed planting hold true again for this year? As some of you know, we planted a 96 and a 103-day hybrid at Aurora at five planting dates ranging from early April to very late May (May 30th) in 2013 and 2014. The 96-day hybrid required ~1140 GDD to silk when planted on May 7th in 2014 but only ~1100 GDD to silk when planted on May 30th (Table 1). Likewise, the 103-day hybrid required ~1230 GDD to silk when planted on May 7th in 2014 but only ~1180 GDD to silk when planted on May 30th (Table 1). 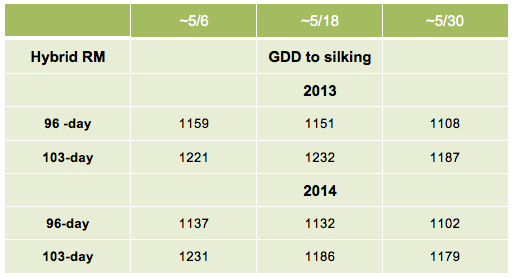 If planting were pushed back another week, the difference in GDD would probably be greater. I believe that the shortening of the silking to ½ milk line or black layer stage will also be occur in 2014. Of course, the shortening of the GDD requirement does come at a small expense to yield. On the other hand, an extended grain-filling period, even with the shortened number of GDD to maturation, should contribute to high overall yields, even at a late planting date. Table 1. Growing Degree Days (GDD) to silking for a 96 day and a 103 day hybrid relative maturity (RM), planted from early to late May at the Aurora Research Farm in Cayuga Co. in 2013 and 2014. Table 2 lists accumulated GDD from May, 15, June 1, and June 8th through August 18th for typical locations in NY where considerable corn is produced (not all key growing locations are represented because the weather stations at those locations are missing too many days or there is no long-term averages for those weather stations). I have also listed the average number of GDD at each location from August 18th through the date of a typical killing frost (light frosts of 30-32 degrees just singe the top leaves, especially leaves that are relatively healthy, and corn can continue to fill the grain when light frosts occur). As you can see, the Finger Lakes and western NY regions, which have been much cooler than eastern and northern NY during the last 5 weeks, have many more GDD remaining before a killing frost compared with eastern and northern NY. Table 2. Growing Degree Days in 2014 (approximate because some dates were missing at some locations) from three dates to August 18th and average number of growing degree days remaining from August 18th until the first killing fall frost. So, if normal temperatures ensue until late September or early October, corn that was planted by June 8th and silked out by August 5th have enough GDD remaining to escape frost damage. Grain growers, however, should expect much higher grain moisture in late October or early November compared with the last few years. What about the remaining 20% of the acreage that was planted after June 8th and didn’t silk out until August 15th, pray for a warm late summer and fall with a very late frost!!! The latest issue of the Northeast Buckwheat Growers Newsletter is available online. The Northeast Buckwheat Growers field day will be August 27 at Edgewood Farm in Groveland, NY on the edge of the Genesee Valley–details in the newsletter.